It comes to a particular stage in life when activities become routinized. Our lives revolve around the things we are keyed to doing. We are engaged in the same things at the same time, and of course they are the right things at that time so we have no issues doing them continuously. And then life becomes so comfortable, so predictable, so safe and oh, so monotonous. Everything seems perfect to us that we fail to realize that there are other things we are missing out on, so many things. Let’s not get it twisted, there is nothing wrong with a perfect life and all, but we need to know that perfect can be boring, being so comfortable with our daily routine can be boring, predictable can be boring and monotonous is definitely boring. There are other new things out there to explore, new challenges to take on and most importantly so much energy in us to channel to other things instead of only a ‘strictly followed’ routine life. And to think we are so engrossed in these things that we are not even aware that we are leading a boring life already. We are so used to the things we do that we can’t see that our lives have become so boring. It is important to know that this article is a shift from the expected ‘what to do to rid yourself of a boring life’, to exploring the signs to look out for that shows that you are leading a boring life. 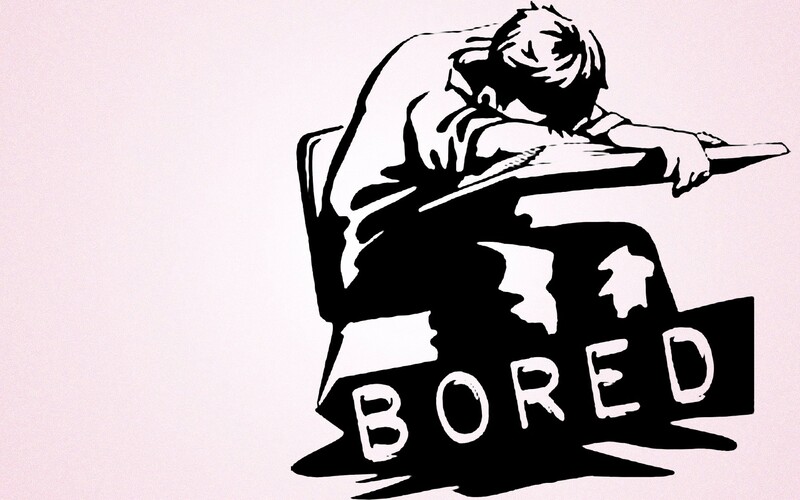 So just in case, you don’t know exactly how to determine if you are leading a boring life, below are five signs discussed to show you if you are leading a boredom life. Being on your phone is not a such a bad idea, after all, you need it to connect with other people. But on the other hand, spending most of your time on the phone is a cry for help. Based on the research carried out by the Pew Research Centre in America, 64% of the people in America own a phone and 93% of them are reported to use their phone to avoid boredom. So yes, being on the phone for most of your time is an indirect escape mechanism for boredom. You might not see it as that. But then, if you notice that apart from the time spent going about your important daily activities, the rest of your time is dedicated to your phone, either speaking with friends or surfing the web and nothing else, you are leading a boring life. Apart from using your phone as an escape mechanism for boredom, another sign that shows that you are leading a boring life is if you sleep too much. After the stress you go through during the day’s work, one would say you need to lie down and catch some rest, that would be right. But what is not right is sleeping at every chance you get, because that would imply that you have nothing else to do. So if you notice that after you get back from work you sleep, during public holidays you sleep at home, during weekends you are home sleeping then you are definitely leading a boring life. A paper published in the journal Nature Communication finds that there is a part of the brain that is associated with motivation and pleasure, and that humans have the tendency to fall asleep in the absence of motivating stimuli, i.e. when bored. So, if you find yourself sleeping at every free time you get, maybe it’s high time you found yourself something motivating to do. What is that thing that catches your fancy, that excites you so much? So much it makes your heart race, so much you can’t wait to get off your regular job and get to it. It might not be a daily thing; it might be a weekly thing. Still, it is something you can’t wait to get to. Your personal interest is something that keeps you occupied when you are supposed to be less busy. So, if you have nothing like that, nothing to keep you busy when you are not doing anything, then you are leading a boring life. Now, that is a feeling we all get at one time or the other. Not being able to wait for the day to pass. Maybe because the day is a hectic one, or a sad one or an uninteresting one, then we say we can’t wait for the day to pass. But when you keep feeling that a day is too long and you can’t wait for it to be over, and when the next comes you feel the same way, and the next and next after it, then maybe your life isn’t an interesting one. One thing I have noticed is that when people have something interesting going on, they won’t want the day to be over so quickly, and when it eventually comes to an end, they would want the next day to come quickly so they can continue with what they were doing the previous day. As for you, all you always want is for the day to be over quickly and when the next day comes you don’t readily embrace it. Maybe that is a sign for you to get involved in something interesting to give your life the spice it is obviously lacking. Daydreaming is a short-term detachment from one’s immediate surroundings, during which a person’s contact with reality is blurred and partially substituted by a visionary fantasy, especially one of happy, pleasant thoughts, hopes or ambitions, imagined as coming to pass, and experienced while awake. Sandi Mann, the psychologist at the University of Central Lancashire confirms that a bored mind moves into a ‘daydreaming’ state. That said if you take the time the time to study yourself and you observe that you daydream a lot when you are at work and when you are out of work. In fact, you can’t wait to get out of work so as to escape into your world of fantasy, then maybe its high time you saved your world of reality. Enough said, if you find yourself guilty of one of the signs above, or more, maybe you should consider doing something to tweak your boring life. Spice it up, be free, go out more, spend time with friends, find a goal, take on new challenges, travel to places you have never been, try new things, do something unlike you. Remember, no one would live your life for you and you only have just one to live, so you should make the best of it. Good luck!